Entering a new market is a unique experience for any business. 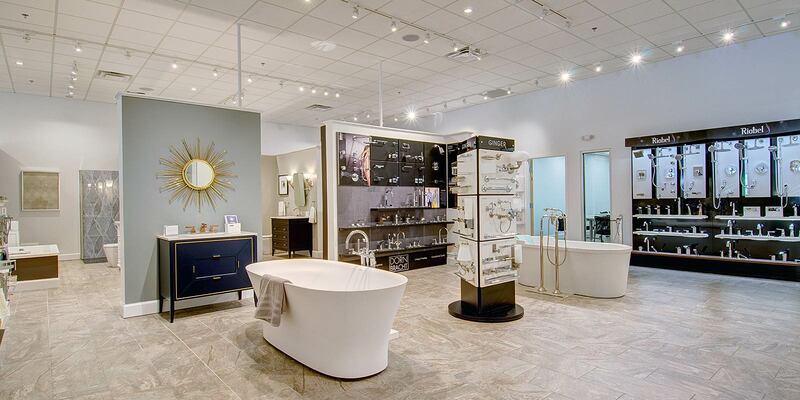 Finding the perfect location, understanding the desires of the potential clientele, and selecting the product lines for display are factors that impact the success of a showroom. 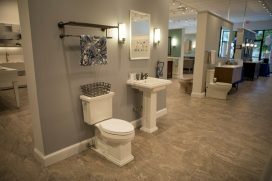 Plumbers’ Supply Company, headquartered in New Bedford, MA, planned to expand its showroom presence into the Boston suburbs for several years after acquiring two showrooms in Dartmouth and Middletown, Rhode Island. 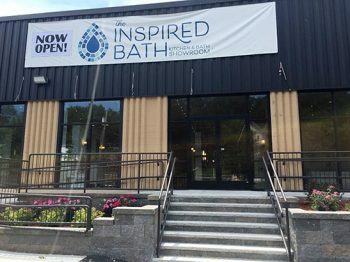 The town of Waltham was selected for the Company’s debut in the Boston area due to its close proximity to the Company’s wholesale locations. After months of real estate hunting, the perfect location was selected in the Waverley Oaks area of Waltham. 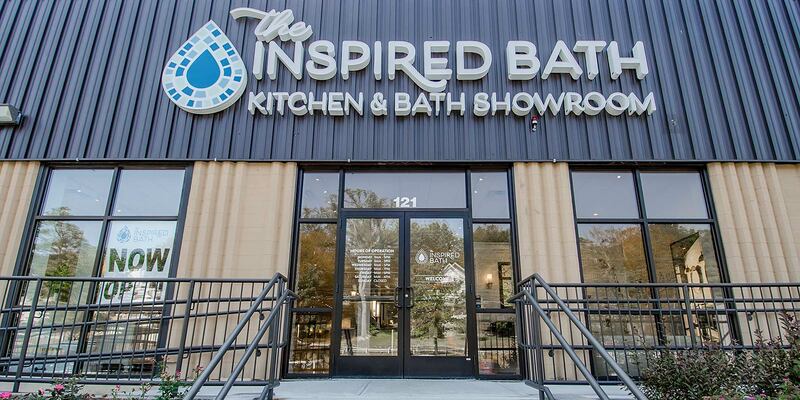 Kevin Lowe, Director of Showrooms for The Inspired Bath, explains the process for establishing and designing a magnificent showroom. 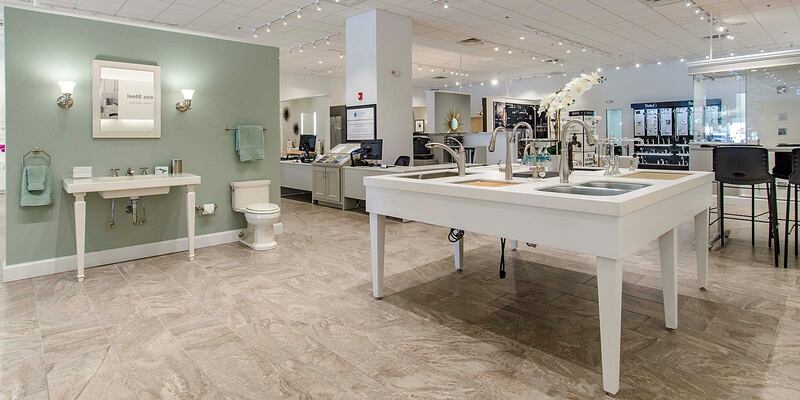 As the first showroom in the Boston area, it was important for the company to select a space that was large enough to showcase a wide variety of today’s most popular product lines. With a spacious 6,000 sq. 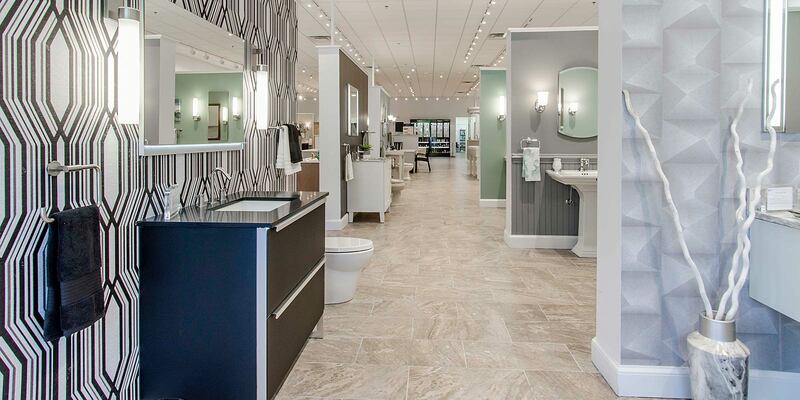 feet, this showroom features 1,078 products compared to 810 in the two other locations. 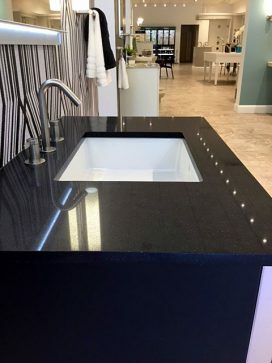 The new showroom has 30 vignettes, an easy to navigate layout, and plenty of wall space lined with glimmering chrome to attract the eyes of the client. 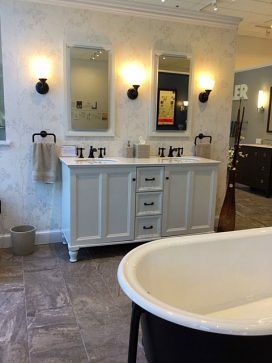 The Inspired Bath collaborated with architect, The Haynes Group and designer Stephanie Marshall to create an open floor plan that allows clients to browse the products in a inspirational environment. This project required weeks of planning, dozens of contractors, and continuous collaboration with manufacturers. 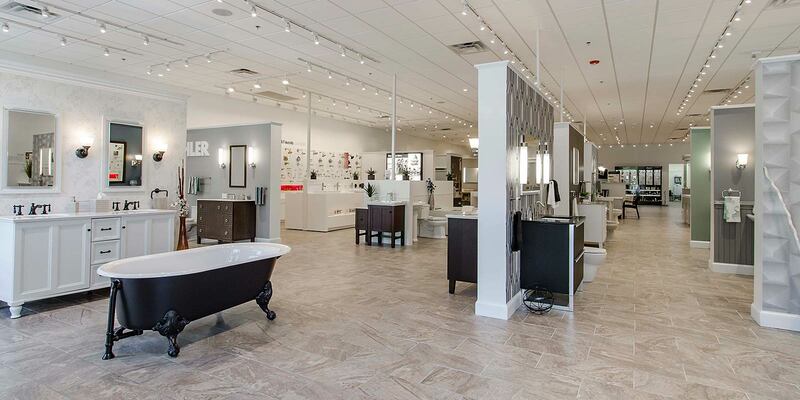 The build out of the showroom took three months from start to finish. With construction and renovation projects, seeing and feeling a product is important in the decision making process. 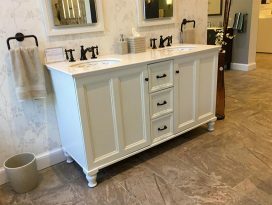 The Inspired Bath Waltham showcases products in a bathroom setting, so clients can envision the fixtures in their own home. Working displays are a feature that you don’t find in every bath showroom, but are influential in the buying process. 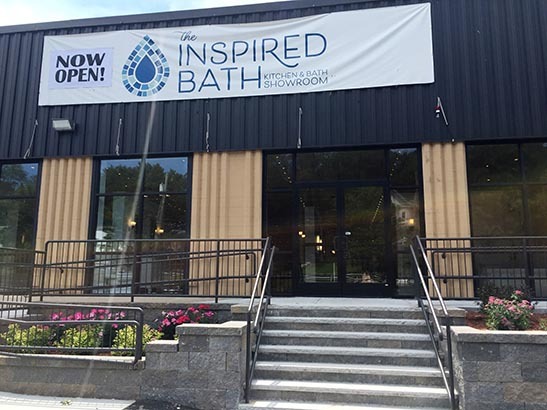 The Waltham location hosts 30 working displays, including a rain head with 775 spray nozzles. 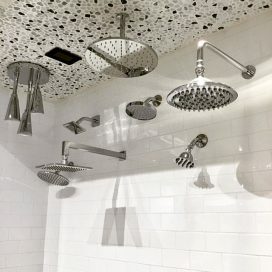 Clients can feel the pressure and spray format of the showerheads while in the showroom. 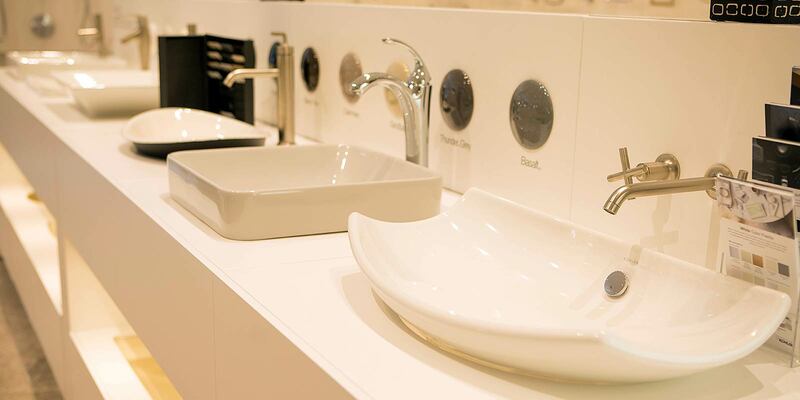 Installing this display required complex plumbing behind the walls and a solid understanding of each product. 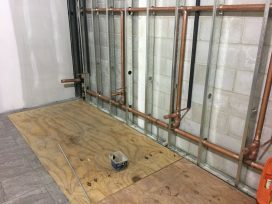 Plumbing contractors worked on site for nearly two months installing piping, fittings, and fixtures throughout the showroom. Identifying the perfect amount of items to display is the art of creating a new showroom. 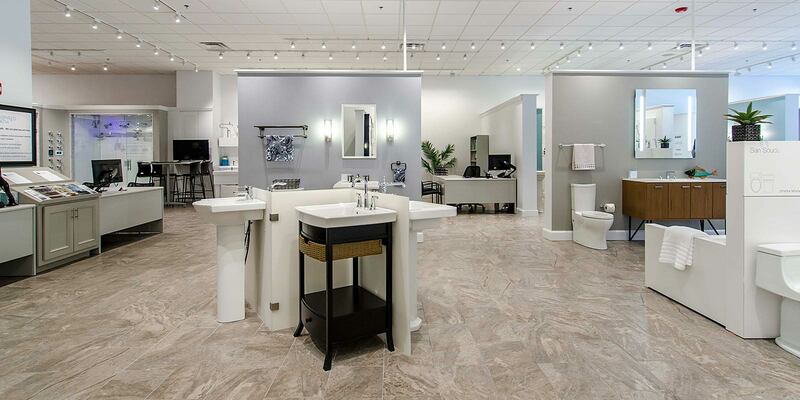 “We don’t want our clients to feel overwhelmed with options when walking the showroom floor,” said Lowe. 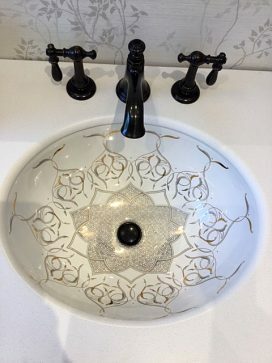 “The products, finishes and configurations we offer are plentiful and our team is happy to help clients find exactly what they are seeking for their kitchen or bath” he continued. 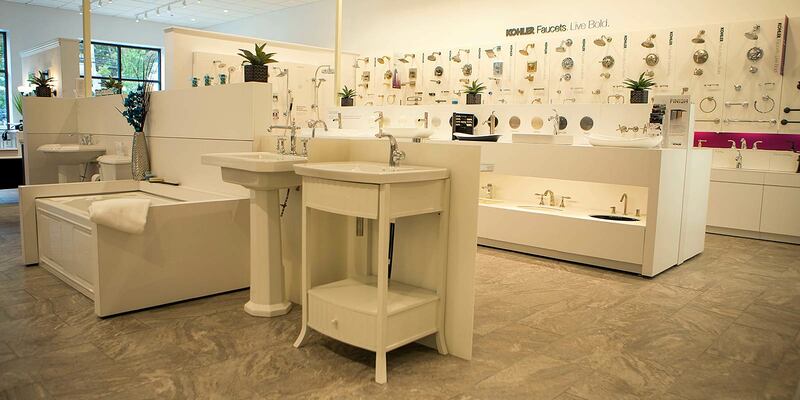 Taking a “less is more” approach to the showroom design helped create a sense of inspiration and luxury. 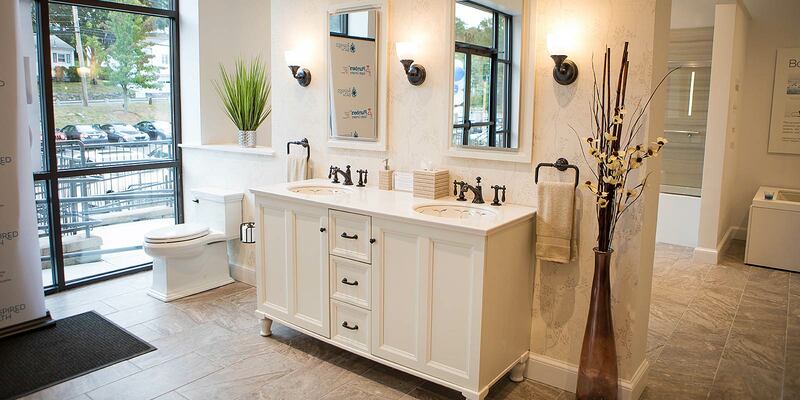 Faucets are showcased with complementary vanities, countertops and accessories. Showers are styled with tile backgrounds and tubs. Inspiration fills every corner of the new space, but Lowe insists that the designers in the showroom are a client’s main resource for information. “Working one-on-one with a designer allows the client the opportunity to fully explore the product options that are available to them,” said Lowe. 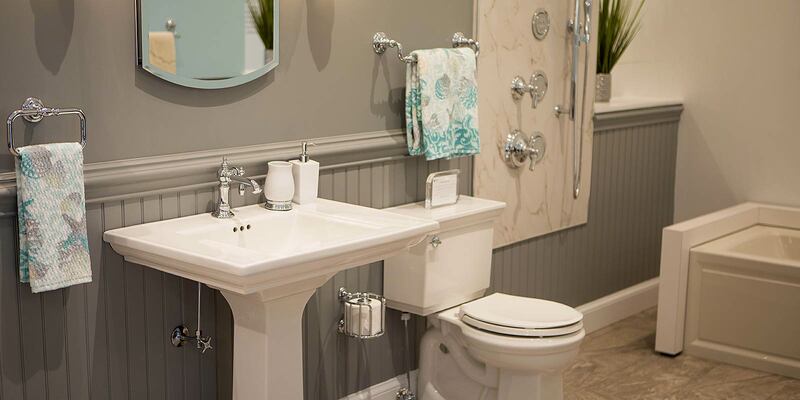 Each homeowner has different needs, spaces and budgets, which is why The Inspired Bath of Waltham offers kitchen and bath products in a variety of styles and price points. As to be expected in a high-end showroom, there are some very impressive items on the floor. 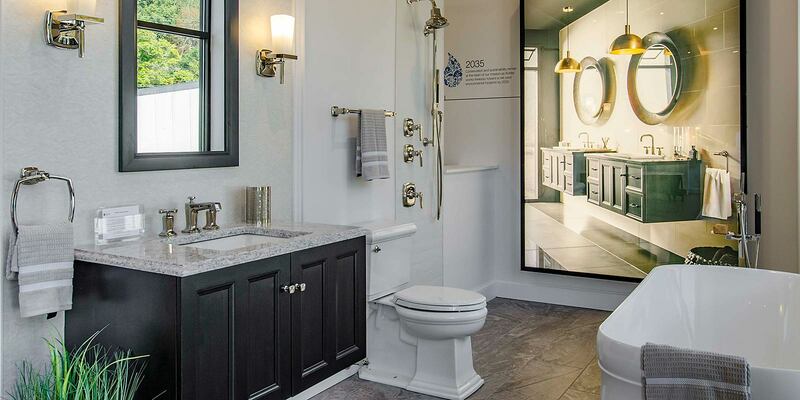 The Real Rain showerhead from Kohler, retailing at $2,000, the porcelain sinks with intricate detailing or the three foot tall tub filler are guaranteed to make you stop and stare.